Age of Bloodshed 3.24 The Socialist Wars Launched! The time has come. The latest and greatest version of the mod has been launched! 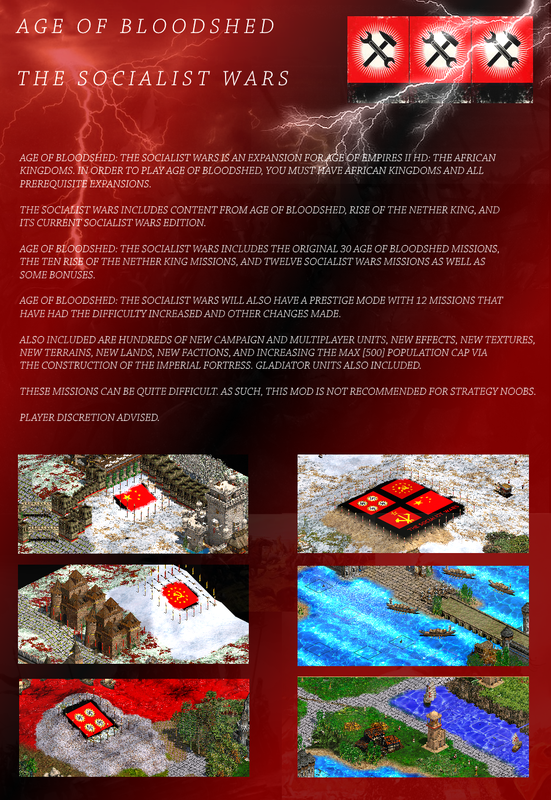 As you all know, this has been one of the largest mod projects ever conceived for Age of Empires II HD: The African Kingdoms. I have been asked if this mod supports other versions of the game. The truth is that I have no reason to believe that it doesn't, but of course, the best experience is the way it was meant to be played. It is meant to be played with The African Kingdoms. There may be a new expansion after this mod, but I have already done so much and I am moving on to other projects. As always, I may return to this mod and add more missions, more textures, and more content. But for now, I am taking a break. This has been a singular project that I have not shared with anyone and it has had a singular focus: to build the greatest Age of Empires II HD mod there is. In the future, there may be other mods that copy my textures and my ideas, but as long as I am given the appropriate credit and you make some slight variations, then we will be okay. You will find the download link below as well as a link to this mod on nexusmods. This is farewell, for now. Click the image below to download the latest version! Click the image below to see the Nexusmods page! Coolness7 returns from a hiatus to reveal more information about the upcoming Age of Bloodshed Expansion. In this Development Blog, Coolness7 reveals further information regarding the next release of Age of Bloodshed. The title of this track is "Caida" by Triangular Ascension. This will be used in the next version of the mod. what is this mod what does it add? Please could you post a list of this mod's soundtrack? The music's good. Most of the music is under the genre "Neo-Classical". I found a mix of similar music. The rest you'll have to explore on your own. How you do in your mod that AI uses all 3 variants of house instead of one? Plz precaisly what file u edited?? Please can anyone help me with this: So I created new unit with new graphic, stats, icon etc but AI player wont build him, of course I can build it as well but AI wont :( Plz someone help me. You will have to write new AI scripts, or adjust unit scripts so that the AI will recognize their unit class and deploy them effectively. So yes, the main files can allow for AI scripts and if you are using the latest version of A.G.E. then you should be able to code the technology trees, buildings, and units to be recognized by the AI. In addition, you can also re-script some of the maps and terrain so the AI can identify them better and respond to threats more efficiently. There are other files in the game that can tweak AI behavior to be more aggressive, etc.